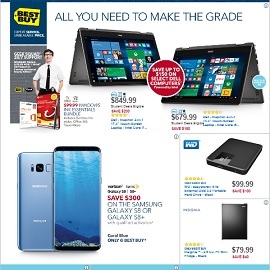 Explore this week best Best Buy flyer savings valid 8/6 – 8/12/2017: $679.99 Dell – Inspiron 2-in-1 13.3″ Touch-Screen Laptop – Intel Core i5 – 8GB Memory – 256GB Solid State Drive – Silver; $849.99 Dell – Inspiron 2-in-1 17.3″ Touch-Screen Laptop – Intel Core i7 – 16GB Memory – NVIDIA GeForce 940MX – 1TB Hard Drive – Gray; $99.99 WD – easystore 4TB External USB 3.0 Portable Hard Drive – Black; $79.99 Insignia – 2.6 Cu. Ft. Mini Fridge – Black; $299.99 Insignia – 43″ Class (42.5″ Diag.) – LED – 2160p – Smart – 4K Ultra HD TV Roku TV – Black; $549.99 Canon – EOS Rebel T6 DSLR Camera with EF-S 18-55mm IS II and EF 75-300mm III lens; $109.00 Google – Home – White/Slate fabric; $229.99 Samsung – 2.1-Channel Soundbar System with 7″ Wireless Subwoofer – Black; $679.99 Asus – 2-in-1 15.6″ Touch-Screen Laptop – Intel Core i5 – 12GB Memory – 1TB Hard Drive – Sandblasted aluminum silver with chrome hinge; $329.99 Lenovo – 15.6″ Laptop – AMD A12-Series – 8GB Memory – 1TB Hard Drive – Platinum gray; $29.99 Logitech – H540 On-Ear USB Headset – Black; and more.